Fokker was accused of copying the designs of others; in fact, he was an admirer of Morane- Saulnier planes and based many of his aircraft on their lines. His Oberursel engine in his planes was a virtual copy of the French Gnome engine. He was accused of fabricating tall tales, such as the story he told about taking the propeller off Garros’ captured plane and single-handedly concocting the mechanism of his landmark Eindekker (single wing) E.I in a marathon forty-eight- our session of frantic engineering. The fact was that he and engineer Heinrich Luebbe had already designed a mechanism that successfully synchronized the propeller with the firing of a machine gun, and had installed it on one of his aircraft. His mechanism had nothing whatever to do with the Garros-Saulnier device, and Fokker promoted the tall tale to hide the fact that he had also offered his invention to the Allies (who turned him down). The first Fokker E.Is reached the front in the summer of 1915, and two fliers in particular showed a facility in handling the new system: Oswald Boelcke, a flier whose exploits as a reconnaissance aviator in an Albatross spotter plane had already earned him the Iron Cross; and Max Immelmann, known as “The Eagle of Lille,” after the town in northern France over which he often prowled. The E.I was further modified to an E.II, E.III, E.IV and eventually E.V versions. 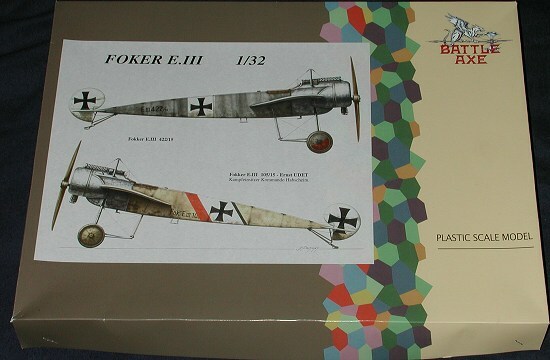 The Fokker had given the Germans control of the air over the Front and it wasn't for quite a long time that the Allies were able to eventually build an aircraft that was the match of the Eindekker. By then, the Germans had built up quite a mass of experience that was rarely matched by the Allies. This is my first experience with a Battle Axe kit, but I had several preconceived notions about it from other French short run kits I've struggled through. This kit is being sent to one of the WWI experts to build so the construction part will have to wait a while. I can tell you that it has a very nice resin gun and engine, the etched brass fret is superbly done and it has a nice looking decal sheet. The kit itself is but a single, very large sprue. The flight surfaces are all a single piece. Surface of the plastic is a bit rough, but nothing like the pits I've experienced with FM and Hi Tech kits; more like Mach II. There is really little flash, which is a big surprise, though all of the parts will require some clean up. The sprue gates are also a bit large so a razor saw is a requirement. What I did find is that there are a mass of ejector towers or ejector pin marks on nearly every part. The lower side of the wings is rife with the small towers and the fuselage interiors (which have nice framework molded inside) has a plethora of these towers will need removed. The box top states that this is a kit for experienced builders and that should be taken to heart. Instructions consist of a single sheet of paper with the construction sequences written on both sides. It seems most complete and offers drawings to help show how parts are supposed to be placed. A full rigging diagram is also provided As you can imagine on a kit this size, several of the etched metal bits are turnbuckles to be used during rigging. No color or painting guide is provided. There is a reference to a Windsock volume that I think anyone attempting this kit should have as a reference. 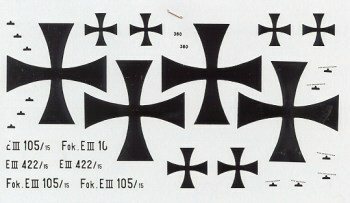 Decals are for two aircraft as shown on the box art. The are a bit on the gloss side and provide all the required insignia and serial numbers. Any additional painting will have to be done for stripes and other such items. If this kit sounds like too much work or is too expensive for what you see, then you are not ready for short run kits. The reason they are short run is because few of them are made. These companies cannot afford the high tech, high quality equipment that Revell, Hasegawa and Italeri have. Therefore, few kits are made and the production standards are not as high. It is up to the builder to compensate for these short-comings when it comes to build the kit. I've built a number of short run kits in my life and while they have all been varying levels of work and challenge, they have all resulted in a kit that was unusual from the mainstream and I was happy with when done. And that is the most important part. If you would like your product reviewed fairly and fairly quickly by asite that has over 200,000 visitors a month, please contactme or see other details in the Note toContributors.